When it comes to killing civilians who needs the ISIS terrorists when you’ve got the USA? WASHINGTON – Just a few months after the U.S. declared ISIS in Iraq “defeated,” a new study has concluded that the U.S.-led battle to remove Daesh (ISIS) from Mosul, once Iraq’s second-largest city, ultimately killed nearly 12 times the number of civilians than were killed by the infamous terror group. 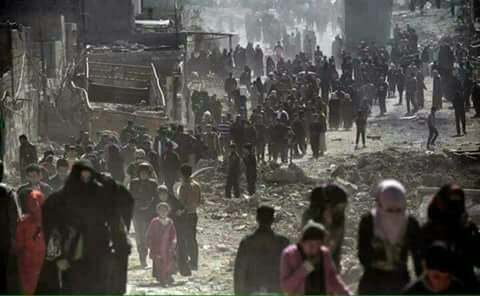 The study, published in the journal PLOS Medicine, surveyed 1,200 households in Mosul for cases of civilian deaths by intentional violence since Daesh first occupied the city in 2014. 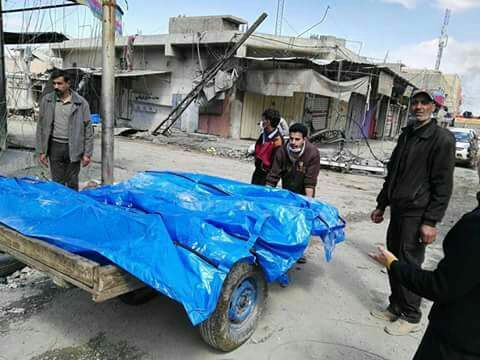 The leading causes of reported deaths were found to have been direct results of the U.S.-led coalition battle to remove Daesh, with airstrikes accounting for around 40 percent of all reported civilian deaths and explosions accounting for another 34 percent. Together, deaths attributable to the coalition accounted for 373 of the 505 total deaths reported. In contrast, the study found that only 22 civilian deaths, accounting for those killed by beheadings and gunshot wounds, were attributable to Daesh. While only around 500 civilian deaths were reported by the households surveyed, the study’s authors noted that these figures are likely an underestimate — citing a high probability of survivor bias, the concentration of air strikes in the western part of the city, and the fact that many Mosul civilians had fled the city prior to the survey. Beyond the imbalance in civilian death tolls caused by the U.S. coalition and Daesh, Gilbert Burnham of Johns Hopkins University, the study’s lead author, pointed out that another key conclusion was the inaccuracy of the coalition airstrikes, which had long been advertised domestically as highly precise, and the coalition’s extensive use of “scorched earth” warfare. Indeed, much of Mosul still remains reduced to rubble, with an unknown number of bodies still hidden under collapsed buildings and debris. Just last month, the bodies of 22 children were pulled from a pile of rubble in the western part of the city, the area most heavily targeted by coalition strikes. Humanitarian concerns or war crimes? Though the findings of this study are troubling, it is hardly the first to examine the deaths of civilians during the U.S.-led operation to “liberate” the city of Mosul. A previous report, published by the United Nations in November of last year, found that the coalition was responsible for the deaths of one in four civilians, with an estimated 2,521 civilians killed and 1,673 wounded during the military operation. 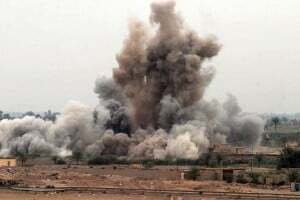 While it found the U.S.-led coalition to be responsible for fewer deaths than this more recent study, the UN report raised similar concerns about the coalition’s use of “imprecise, explosive weapons, killing thousands of civilians,” further suggesting that the coalition’s bombing tactics “may constitute [a] war crime.” Such concerns about war crimes have also been raised by human-rights groups, such as Amnesty International, which has criticized the coalition’s use of unnecessary force and practice of indiscriminately targeting civilians. Despite concern over the coalition’s bombing tactics and the resulting civilian casualties, the Pentagon has long been dismissive of such concerns, shifting from denial to defiance over the high death toll. For instance, in responding to criticism over a single strike that killed hundreds of civilians in Mosul, the Pentagon cited video footage of Daesh forcing hundreds of civilians into the buildings the U.S. later bombed as “provoking the attack” — essentially admitting that the U.S. knew those buildings were full of civilians but chose to bomb the location anyway. Though the chemical weapon is authorized for use to illuminate targets and create smokescreens, its use is not authorized to do so near civilian populations, particularly dense urban centers like Mosul. Furthermore, video footage showing white phosphorus bombs in the center of the Mosul suggest that the chemical was not being used a “smokescreen” to help shield escaping civilians from view but was rather part of the coalition’s bombing strategy. In addition, despite all the carnage the U.S. coalition brought on Mosul in its bid to drive out Daesh, Daesh militants are still present in the city, suggesting that the “defeat” of Daesh in Mosul was not quite what it was made out to be. On Sunday, three Daesh militants were caught in Mosul, followed by two more who were arrested yesterday. While Mosul is certainly better off under the control of the Iraqi government as opposed to foreign-funded terrorist groups, this latest study adds more evidence to the charge that the U.S.-led coalition’s actions in Mosul were hardly grounded in the humanitarian concern that the U.S. government so frequently invokes when justifying the use of its military abroad. Filed under: Al Qaeda, IRAQ, ISIL, US Congress, US Foreign Policy, USA, War on Iraq, War on Syria, Wars for Israel | Tagged: Mosul |	Comments Off on When it comes to killing civilians who needs the ISIS terrorists when you’ve got the USA? Numbers are numbing, especially numbers that rise into the millions. But please remember that each person killed represents someone’s loved one. March 19 marks 15 years since the U.S.-U.K invasion of Iraq in 2003, and the American people have no idea of the enormity of the calamity the invasion unleashed. The US military has refused to keep a tally of Iraqi deaths. General Tommy Franks, the man in charge of the initial invasion, bluntly told reporters, “We don’t do body counts.” One survey found that most Americans thought Iraqi deaths were in the tens of thousands. But our calculations, using the best information available, show a catastrophic estimate of 2.4 million Iraqi deaths since the 2003 invasion. The number of Iraqi casualties is not just a historical dispute, because the killing is still going on today. 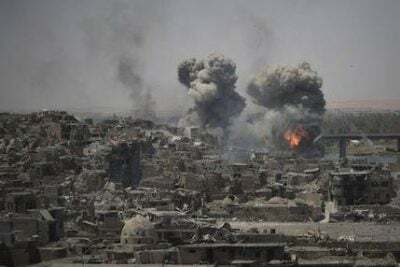 Since several major cities in Iraq and Syria fell to Islamic State in 2014, the U.S. has led the heaviest bombing campaign since the American War in Vietnam, dropping 105,000 bombs and missiles and reducing most of Mosul and other contested Iraqi and Syrian cities to rubble. An Iraqi Kurdish intelligence report estimated that at least 40,000 civilians were killed in the bombardment of Mosul alone, with many more bodies still buried in the rubble. A recent project to remove rubble and recover bodies in just one neighborhood found 3,353 more bodies, of whom only 20% were identified as ISIS fighters and 80% as civilians. Another 11,000 people in Mosul are still reported missing by their families. Of the countries where the U.S. and its allies have been waging war since 2001, Iraq is the only one where epidemiologists have actually conducted comprehensive mortality studies based on the best practices that they have developed in war zones such as Angola, Bosnia, the Democratic Republic of Congo, Guatemala, Kosovo, Rwanda, Sudan and Uganda. In all these countries, as in Iraq, the results of comprehensive epidemiological studies revealed 5 to 20 times more deaths than previously published figures based on “passive” reporting by journalists, NGOs or governments. Two such reports on Iraq came out in the prestigious The Lancet medical journal, first in 2004 and then in 2006. The 2006 study estimated that about 600,000 Iraqis were killed in the first 40 months of war and occupation in Iraq, along with 54,000 non-violent but still war-related deaths. The US and UK governments dismissed the report, saying that the methodology was not credible and that the numbers were hugely exaggerated. In countries where Western military forces have not been involved, however, similar studies have been accepted and widely cited without question or controversy. Based on advice from their scientific advisers, British government officials privately admitted that the 2006 Lancet report was “likely to be right,” but precisely because of its legal and political implications, the U.S. and British governments led a cynical campaign to discredit it. A 2015 report by Physicians for Social Responsibility, Body Count: Casualty Figures After 10 Years of the ‘War on Terror,” found the 2006 Lancet study more reliable than other mortality studies conducted in Iraq, citing its robust study design, the experience and independence of the research team, the short time elapsed since the deaths it documented and its consistency with other measures of violence in occupied Iraq. The Lancet study was conducted over 11 years ago, after only 40 months of war and occupation. Tragically, that was nowhere near the end of the deadly consequences of the Iraq invasion. In June 2007, a British polling firm, Opinion Research Business (ORB), conducted a further study and estimated that 1,033,000 Iraqis had been killed by then. While the figure of a million people killed was shocking, the Lancet study had documented steadily increasing violence in occupied Iraq between 2003 and 2006, with 328,000 deaths in the final year it covered. ORB’s finding that another 430,000 Iraqis were killed in the following year was consistent with other evidence of escalating violence through late 2006 and early 2007. Just Foreign Policy’s “Iraqi Death Estimator” updated the Lancet study’s estimate by multiplying passively reported deaths compiled by British NGO Iraq Body Count by the same ratio found in 2006. This project was discontinued in September 2011, with its estimate of Iraqi deaths standing at 1.45 million. Taking ORB’s estimate of 1.033 million killed by June 2007, then applying a variation of Just Foreign Policy’s methodology from July 2007 to the present using revised figures from Iraq Body Count, we estimate that 2.4 million Iraqis have been killed since 2003 as a result of our country’s illegal invasion, with a minimum of 1.5 million and a maximum of 3.4 million. These calculations cannot possibly be as accurate or reliable as a rigorous up-to-date mortality study, which is urgently needed in Iraq and in each of the countries afflicted by war since 2001. But in our judgment, it is important to make the most accurate estimate we can. Numbers are numbing, especially numbers that rise into the millions. Please remember that each person killed represents someone’s loved one. These are mothers, fathers, husbands, wives, sons, daughters. One death impacts an entire community; collectively, they impact an entire nation. As we begin the 16th year of the Iraq war, the American public must come to terms with the scale of the violence and chaos we have unleashed in Iraq. Only then may we find the political will to bring this horrific cycle of violence to an end, to replace war with diplomacy and hostility with friendship, as we have begun to do with Iran and as the people of North and South Korea are trying to do to avoid meeting a similar fate to that of Iraq. Nicolas J S Davies is the author of Blood On Our Hands: the American Invasion and Destruction of Iraq and of the chapter on “Obama At War” in Grading the 44th President: A Report Card on Barack Obama’s First Term as a Progressive Leader. Featured image is from Oxfam International. March 19 marks 15 years since the U.S.-U.K invasion of Iraq in 2003, and the American people have no idea of the enormity of the calamity the invasion unleashed. The U.S. military has refused to keep a tally of Iraqi deaths. General Tommy Franks, the man in charge of the initial invasion, bluntly told reporters, “We don’t do body counts.” One survey found that most Americans thought Iraqi deaths were in the tens of thousands. But our calculations, using the best information available, show a catastrophic estimate of 2.4 million Iraqi deaths since the 2003 invasion. An Iraqi Kurdish intelligence report estimated that at least 40,000 civilians were killed in the bombardment of Mosul alone, with many more bodies still buried in the rubble. A recent project to remove rubble and recover bodies in just one neighborhood found 3,353 more bodies, of whom only 20 percent were identified as ISIS fighters and 80 percent as civilians. Another 11,000 people in Mosul are still reported missing by their families. Two such reports on Iraq came out in the prestigious The Lancet medical journal, first in 2004 and then in 2006. The 2006 study estimated that about 600,000 Iraqis were killed in the first 40 months of war and occupation in Iraq, along with 54,000 nonviolent but still war-related deaths. The U.S. and U.K. governments dismissed the report, saying that the methodology was not credible and that the numbers were hugely exaggerated. In countries where Western military forces have not been involved, however, similar studies have been accepted and widely cited without question or controversy. Based on advice from their scientific advisers, British government officials privately admitted that the 2006 Lancet report was “likely to be right,” but precisely because of its legal and political implications, the U.S. and British governments led a cynical campaign to discredit it. A 2015 report by Physicians for Social Responsibility, Body Count: Casualty Figures After 10 Years of the “War on Terror”, found the 2006 Lancet study more reliable than other mortality studies conducted in Iraq, citing its robust study design, the experience and independence of the research team, the short time elapsed since the deaths it documented and its consistency with other measures of violence in occupied Iraq. BAGHDAD – On a sandstorm-swept morning in Baghdad earlier last week, Abu Mahdi al-Mohandes, the legendary deputy leader of Hashd al-Shaabi, a.k.a. People Mobilization Units (PMUs) and the actual mastermind of numerous ground battles against ISIS/Daesh, met a small number of independent foreign journalists and analysts. Mohandes took time out of the battlefield especially for the meeting, and then left straight for al-Qaim. He was sure “al-Qaim will be taken in a matter of days” – a reference to the crucial Daesh-held Iraqi border town connecting to Daesh stronghold Abu Kamal in Syria. That’s exactly what happened only four days later; Iraqi forces immediately started a mop up operation and prepared to meet advancing Syrian forces at the border – yet more evidence that the recomposition of the territorial integrity of both Iraq and Syria is a (fast) work in progress. The meeting with Mohandes was held in a compound inside the massively fortified Green Zone – an American-concocted bubble kept totally insulated from ultra-volatile red zone Baghdad with multiple checkpoints and sniffer dogs manned by US contractors. Adding to the drama, the US State Department describes Mohandes as a “terrorist”. That amounts in practice to criminalizing the Iraqi government in Baghdad – which duly released an official statement furiously refuting the characterization. Its 25 combat brigades – comprising Shi’ites, Sunnis, Christians, Yazidis, Turkmen, Shabak and Kurds – have been absolutely crucial in the fight against Daesh in Samarra, Amerli, Jalawla, Balad, Salahuddin, Fallujah (35 different battles), Shirqat and Mosul (especially over the western axis from Qayarah base to the Iraq-Syrian border, cutting off supply chains and sealing Mosul from an attempted Daesh escape to Syria). Mohandes describes the PMUs as “an official military force” which plays a “complementary role” to the Iraqi Army. The initial plan was for the PMUs to become a national guard – which in fact they are now; “We have recon drones and engineering units that the Army does not have. We don’t mind if we are called gendarmes.” He’s proud the PMUs are fighting an “unconventional war”, holding the high ground “militarily and morally” with “victories achieved in record time”. And “contrary to Syria”, with no direct Russian support. “we didn’t even have AK-47s. Iran gave them to us. The US embassy had 12 Apache helicopters ready to transport diplomats if Baghdad fell to Daesh”. Mohandes considers the [Western] “media war waged against Hashd al-Shaabi” as “normal from the beginning”; “Countries that supported terrorism would not perceive that a popular force would emerge, and did not recognize the new political system in Iraq.” On that note, he added ruefully, “you can smell petrol”. 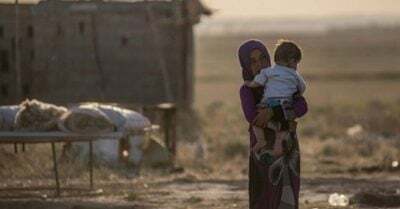 The PMUs absolutely insist on their protection of ethnic minorities, referring to thousands of Sabak, Yazidi and Turkmen – among at least 120,000 families – forced by Daesh rule into becoming IDPs. After liberation battles were won, the PMUs provided these families with food, clothing, toys, generators and fuel. I confirmed that many of these donations came from families of PMU fighters all across the country. PMU priorities include combat engineering teams bringing families back to their areas after clearing mines and explosives, and then reopening hospitals and schools. For instance, 67,000 families were resettled into their homes in Salahuddin and 35,000 families in Diyala. Pakistani Prof. Hassan Abbas, from the College of International Security Affairs at the National Defense University in Washington, went even further, as we extensively discussed not only Iraq and Syria but also Afghanistan and Pakistan; “Iraq is now in a unique position heading towards a democratic, pluralistic society”, proving that “the best answer to sectarianism is religious harmony.” This “inclusiveness against Takfirism” must now connect in the streets “with the rule of law and a fair justice system”. Abbas points out that the base for Iraq to build up is law enforcement via scientific investigation; “Policing is the first line of defense”. Baghdad has been able, almost simultaneously, to pull off two major game-changers; a military victory in Mosul and a political victory in Kirkuk. If Iraq stabilizes, erasing the Daesh death cult, so will Syria. As al-Jebouri notes, “now every community must have a cut of the cake.” At least 7 million jobs and pensions are paid by Baghdad. People want the return of regularly paid salaries. That starts with decent security all over the country. Mohandes was the engineer – his actual profession – of key battles against Daesh. There’s a wide consensus in Baghdad that without him Daesh would be firmly installed in the Green Zone. After days talking to Hashd al-Shaabi personnel and observing how they operate a complex hybrid warfare battlefield coupled with an active recruitment process and heavy presence in social media, it’s clear the PMUs are now firmly established as a backbone underpinning Iraqi state security, an array of stabilization programs – including much needed medical services – and most of all, introducing a measure of efficiency Iraq was totally unfamiliar for almost three decades. It’s a sort of state-building mechanism springing out of a resistance ethic. As if the ominous Daesh threat, which may have led to as many as 3.1 million IDPs, shook up the collective Iraqi subconscious, awakened the Iraqi Shi’ite proletariat/disenfranchised masses, and accelerated cultural decolonization. And this complex development couldn’t be further from religious bigotry. Referring to the Daesh offensive, Jaafari insisted “Iraq did not commit a crime” in the first place, but hopefully there’s “a new generation of youth capable of reinforcing the experiment”. The emphasis now, following reconciliation, is on “an era of national participation”. He’s adamant that “families of Daesh members should not pay for their mistakes.” Daesh informers will be duly put on trial. I asked the Foreign Minister if Baghdad did not fear being caught in a lethal crossfire between Washington and Tehran. His response was carefully measured. He said he had enough experience of dealing with “radical” neocons in D.C. And at the same time he was fully aware of the role of the PMUs as well as Iran in Iraq’s reassertion of sovereignty. His warm smile highlighted the conviction that out of the ashes of a cultish black death, the Iraqi renaissance was fully in effect. 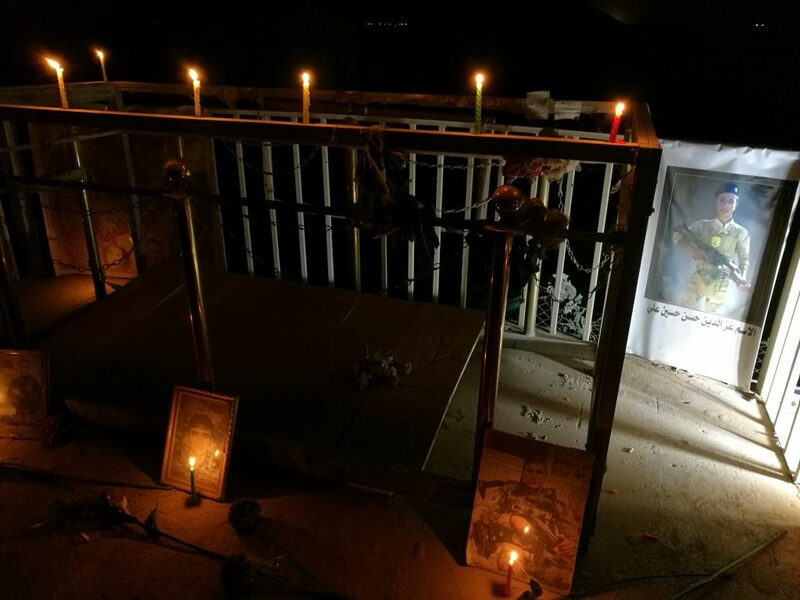 TIKRIT and NAJAF, Iraq – Nothing, absolutely nothing prepares you to revive, on the spot, the memory of what will go down in history as ISIS/Daesh’s most horrid killing field in Iraq or Syria since the death cult stormed across the border in the summer of 2014; the Speicher massacre of June 12, 2014 – when almost 2,000 Iraqi army recruits were assassinated in and nearby a former Saddam Hussein palace on the banks of the Tigris near Tikrit. As Dylan would sing it, “ain’t it just like the night to play tricks when you’re trying to be so quiet”. In 2003, a few days after Shock and Awe and the fall of Baghdad, I took the road to Tikrit for Asia Times to survey Uday Hussein’s bombed palace as well as his father’s birthplace, only to return 14 years later to one of those palaces turned into a house of horror. The Speicher killing field was gruesomely staged – and filmed – by Daesh only a few days after the fall of Mosul. Daesh’s Salafi-jihadi goons were feted as “liberators” by many a Sunni tribe around Trikrit just as 10,000 Iraqi Army recruits from different provinces, mostly Shi’ites, were being trained at an Air Force academy nearby. With Daesh fast advancing and the Iraqi Army at the time dissolving by the minute, the youngsters were ordered to switch into civilian clothes, leave their weapons behind, and go home. As they were literally walking back to their home provinces they ended up falling in a lethal Daesh trap. Bearing echoes of the Nazi era, the youngsters were divided into Sunnis and Shi’ites – with the Shi’ites bundled in trucks described as their “transportation” home. Instead they were taken to what would become a killing field framed by decaying Saddamist architecture. It’s late evening on a windless Monday – and I’m standing at the eerily silent exact spot of one of the killing field’s sites, captured by a Daesh propaganda video in part of this harrowing footage. Hayder Atamiri, the official representative of the Tikrit massacre committee, almost in tears, swears, “all the tribes in the area took part in this”. He’s convinced the massacre took place in “an icon of Saddam” and it was “revenge for Saddam’s death”. Other figures by the Iraqi Ministry of Health list 1,935 dead – with 994 bodies found, 527 fully identified, 467 under examination and still 941 missing. A systematic search for human remains only started in March 2015 – eight months after the massacre – when Tikrit was finally recaptured by Baghdad’s forces. Compared with Ramadi or Mosul, Tikrit suffered very little damage as it was reconquered largely by Hashd al-Shaabi, a.k.a. the People Mobilization Units (PMUs), called into action by Grand Ayatollah Sistani’s 2014 fatwa. Atamiri is adamant “Hashd was the only force liberating Tikrit.” And crucially these fighters were not Shi’ites; they were Sunnis. In the complex Iraqi tribal chessboard, the local consensus is that certain Wahhabi-tinged jihadis were part of the Speicher massacre, but that did not translate into a collective Sunni endeavor. Daesh killed Sunnis as well, and Sunnis helped at least a few Shi’ites to flee. Families of the murdered youngsters silently exhibit photos of their sons and ask “international bodies to do something”. They all agree; the response from the “international community” has been shameful. Still, the Tikrit massacre committee vows to keep the memory of Speicher alive. Mothers of victims have been to Geneva to ask for help as well as mental health support for quite a few families, and plan to visit again in June 2018. This has been one of Iraq’s most devastating nightmares of the past three decades. After such sorrow, what forgiveness? It’s possible. From agony to ecstasy. There could not be a more radical contrast between darkness and light than taking the road to Najaf – the Iraqi Vatican, and fourth holiest city in Islam – and Karbala, alongside millions of black-clad pilgrims during the annual celebration of Arba’een, the “40th Day” of the martyrdom of Imam Hussein. Countless tents, tea shops and impromptu restaurants, festively decorated, line up the road to Najaf and Karbala. Suddenly we’re thrown into the vortex of the largest gathering of humans in history, way outdoing the annual Hajj pilgrimage to Mecca; nearly 20 million people as opposed to about 1.5 million. Here is the record of my own pilgrimage in 2003 – a few days after the fall of Baghdad. The Imam Ali shrine, in all its splendor, is managed, at the highest instance, by the marja’iya – the religious sources of emulation, mostly personified by Grand Ayatollah Sistani, whose office is in a narrow alley nearby; and in practice, by a foundation. According to its secretariat “more than 20 million people are registered in the shrine”. Najaf welcomed refugees of the fight against Daesh by the tens of thousands; Sunnis from Anbar province, Christians, Shi’ite Turkmen from Tal Afar; “Now many are back to their communities”. The PMUs are incredibly popular – their white flags fluttering everywhere alongside black Imam Hussein and multicolored Imam Ali banners. The shrine is proud to at least assist in helping victims from the Speicher massacre; “The government may be shorthanded”. I was in Najaf last week, at the start of the pilgrimage. But the apex of Arba’een is today, November 10. And that happens in the most extraordinary of historical circumstances; the final defeat of Daesh. The Syrian Arab Army (SAA) announced on Wednesday it had captured Albu Kamal, the last town held by Daesh in Syria – after Iraqi forces captured its sister town across the border, al-Qaim. In Baghdad, before leaving to Najaf, I was assured by a top PMU commander that al-Qaim would be retaken “in a matter of days”: four, in the end, to be exact. None of this is getting traction in Western media. The final victory on the ground against Daesh, in Syria, was accomplished by the Syrian army with help from Russian strategy and air power, and in Iraq by the Iraqi army and the PMUs. Syrian and Iraqi forces are symbolically reunited at the border. 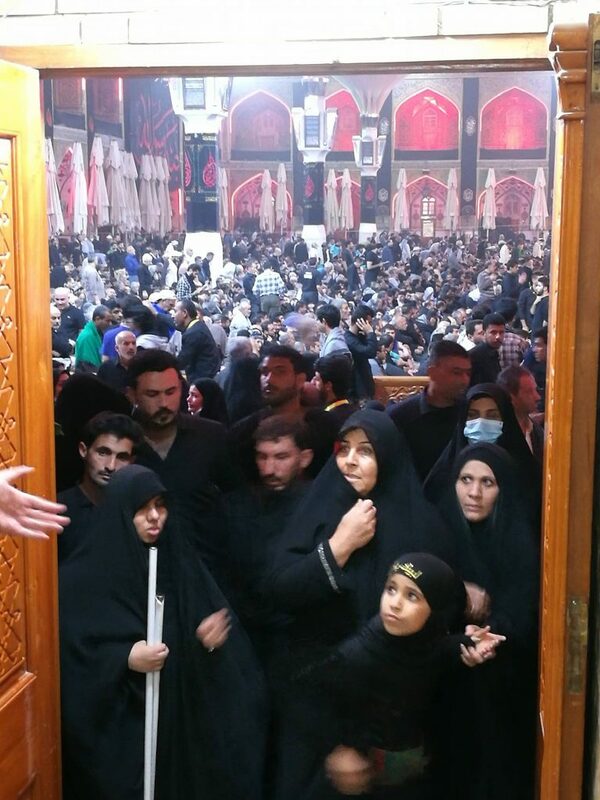 Meanwhile, at this very moment, millions of souls – Iraqis, Iranians, Afghans, Pakistanis, northern Africans, Central Asians, Persian Gulf nationals – are being soothed via the massive, cathartic walk from Najaf to Karbala. A pilgrim captured the spell – spiritual redemption merging with political statement – as he told me, with the flicker of a smile, the walk is also “a protest against terrorism”. Presented in a panel discussion of a side event at the 36th UN Human Rights Council in Geneva: “the destruction of Mosul”. After 267 days, the end of the battle of Mosul was announced on July 10th. “Liberation” is a misleading notion, because the hostilities have not stopped, the human suffering has not stopped. There are still victims in the city every day on both sides. Many refugees have no home to go back to and are suffering from severe mental health problems, especially the children. 9 of the 10 major hospitals. 76 of the 98 medical centres. 6 big bridges across the Tigris. 400 educational institutions, including schools, universities and education centres. 6 water purifying systems and much of the city’s water infrastructure has been booby trapped. 212 oil refineries, petrol and fuel stations. All state and private banks. 63 religious centres (churches and mosques), most of them valuable historical sites. 250 workshops, factories and small factories, including agro-industries. And in the rest of Iraq, the humanitarian and security situation remains disastrous. More than one million people have been displaced since the military operations to recapture the city of Mosul since October 2016, with about three quarters of West Mosul since April. While 1.95 million people have returned to their residences, 3.2 million people remain internally displaced in Iraq and need humanitarian aid. More than 3 million children attend school irregularly, while 1.2 million children do not go to school at all. How many more lost generations will this war produce? The extent of civilian casualties, the massive destruction of American bombs, missiles and artillery and the use by the American army of white phosphorus, a weapon that is internationally forbidden for use in populated areas, are all serious US war crimes. The catastrophic number of civilian deaths in Mosul receives little international attention from politicians and journalists. This is in stark contrast to the global outrage of the bombing of East Aleppo by the Syrian government and the Russian troops at the end of 2016. It is believed that more than 40,000 civilians have been killed as a result of the massive firepower that was used against them, especially by the federal police, air attacks and ISIS itself. Neither ISIS nor the international coalition, neither the Iraqi government nor the United Nations, provide accurate information about numbers of victims, while groups such as Airwars largely focus on press reports. Airwars estimates that 5.805 civilians have been killed between 19 February and 19 June 2017. However, as always, press reports only cover a fraction of the actual number of deaths. People are trying to understand why the death toll in Mosul is so high. A solid explanation can be read in a shocking report by Amnesty International (AI): “At Any Cost: The Civilian Catastrophe in West Mosul”. This report does not provide a precise figure of the number of deaths, but it confirms the terrible damage that was caused by continuous artillery and rocket fire for a period of five months in a closed area with civilians who were unable to escape. Other reports from Mosul state that the Civil Defense Unit has already removed more than 2.000 bodies from the rubble. Most victims are reportedly women and children. It is believed that more than 4.000 bodies are buried under the rubble in West Mosul. According to the US, the Joint Operations Command, approximately 1,400 bodies were already excavated. The head of the civil defense unit, Lt. Kol. Rabia Ibrahim Hassan, told the Washington Post that he had asked the government for more equipment and resources, but that he had not received any response. During the fighting to recapture Ramadi and Fallujah – the previous military campaigns – most residents fled or evacuated before the fighting. However, many Moslawis (Mosul residents) remained in their homes, making the operation much more complicated. Some stayed because ISIS killed the people who tried to escape, some remained because they refused to leave their homes or relatives, some because they had some kind of work, but many remained because the government asked them to. The army threw leaflets from helicopters asking residents not to flee. Premier Haider al Abadi organized a victory parade in Baghdad on Saturday, July 15, where Iraqi armed forces marched before his eyes in the strictly protected Green Zone of the capital. It is a sign for the state of the country that the parade was not publicly announced due to security issues, that the media only came to know later and that the people of the city were excluded from the ‘festivities’. But there was no real reason for celebration because of the enormous losses suffered by Iraqi forces. The Counter Terrorism Service (CTS), an American trained unit, the elite armed forces of Iraq, has lost 40 percent of its people in the struggle for Mosul. While the Baghdad government has always refused to disclose its military losses, this figure was reported by the US Department of Defense, which calls for $ 1,269 billion to rebuild the unit over the next three years and train 20,000 staff members. About the losses in other units, such as the Hashd al-Shaabi or Popular Mobilization Forces and the regular combat troops, little is known. There are indications that the losses of the regular armed forces are greater than those of the CTS. If this may be an indication: Middle East Monitor reported on February 23 that 7,000 Iraqi soldiers and military members had been killed. What about the losses of the “enemy”? Contrary to the underestimation of civilian casualties, Iraq and the US continuously keep on increasing the number of casualties among ISIS warriors. On July 16, General Abdul Amir Yarallah of the Ninewa Operation Command announced that more than 25,000 rebels were killed during the Mosul campaign. On July 19th, that number had already risen to 30,000. To emphasize how the Iraqi government increases its numbers: in January, the Iraqi Ministry of Defense declared that there were only 9,400 IS elements in Mosul. General Sean MacFarland, Commander of the US coalition, estimated that in August 2016 only 15,000 to 20,000 IS fighters remained in Iraq and Syria. The Iraqis claim to have killed more ISIS members in Mosul only than there are in the whole Middle East. During a discussion at the Aspen Security Forum on Friday, July 21, General Raymond Thomas, head of the US Special Operations Command, even claimed that the US-led offensive had killed 60,000 to 70,000 ISIS militants. He has probably included the civilian casualties in this figure. According to the International Organization for Migration (IOM), the nine-month siege forced 1,048,044 people to flee. On 25 September, according to UNHCR, 823.000 Moslawi’s remained displaced by the offensive. On 21 September, Iraqi migration authorities have counted 1,74 million refugees since the launch of operations to retake major ISIS strongholds in October 2016. The Iraqi government plans to repatriate all refugees from Mosul by the end of 2017. But that may well be wishful thinking. Men, women and children who escaped from the destruction of Mosul are housed in tents camps, often in virtual prisons. Women and children suspected of being family members of IS warriors killed in the siege are redirected to “rehabilitation camps”. Return is impossible for the majority of these internally displaced war refugees. Many do not have homes to return to because of the artillery and air attacks. Most of the city has no access to water and electricity, food is scarce and schools and hospitals are destroyed. The Ministry of Migration tries to encourage the displaced persons to return to their homes. Seminars are held in refugee camps to encourage people to return. The UN interviewed displaced after such a presentation. Some said they had nothing to return because their homes were destroyed. They had no money left and felt nothing to return until the services were restored and the economy was re-launched. Another problem that the United Nations noted was that the Migration Department has no programs for people returning. The ministry also does not provide the monthly payments on which displaced persons are entitled. It is estimated that at least 10 percent of explosives from the US coalition have not exploded, causing thousands of bombs and grenades waiting to explode, on top of the abandoned booby traps left by ISIS. Experts have warned that it may take a decade to clear all explosives in the city. There is a high level of corruption among the Iraqi soldiers occupying Mosul. They undermine the security measures to neutralize ISIS in the wake of their defeat. Suspects may proceed through military checkpoints, after payment of $ 1,000 and can bring a vehicle after payment of $ 1,500. Mosul residents are sceptic of what they can expect from government forces. Corruption by the occupying military takes various forms. Moslawis pay soldiers $ 100 for removing a body from the debris and others pay $ 500 to return to their home, if it’s still habitable. Iraqi military and military units have always been accused of asking money for citizens’ protection, demanding money for truckers bringing goods to the civilian population and thus being a particularly profitable milk cow if they have to go through military checkpoints. Destruction is nothing new in Iraq, and neither is the mismanagement of rebuilding, This problem was on prominent display in a 2013 report by the Special Inspector General for Iraq Reconstruction, which found that the $60 billion in U.S. funds spent over 10 years in the country produced few tangible results. The report blamed this on poor coordination with Iraqis, misplaced priorities, misplanned projects, contractor wastefulness, corruption, and security problems. Iraq’s government, which spent $138 billion during this period, did not do any better. Former Prime Minister Nouri al-Maliki has “lost” 500 billion dollars during his term of office (2006-2014), according to the Iraqi Commission of Integrity (CoI). The CoI is responsible for investigating corruption scandals in Iraq. “Nearly half of government revenues during the eight-year period was ‘stolen’”, according to the spokesman for the Col, in what he called “the biggest political corruption scandal in history”. Iraq’s oil revenues amounted to $ 800 billion between 2006 and 2014, and the Maliki government also received $ 250 billion from various countries, including the US. Mosul (Nineveh) is one of the oldest and largest cities of ancient times. The area around the city was already sedentary in 6,000 BC, and in 3,000 BC it was an important religious center in honor of the Mesopotamian goddess Ishtar. The early city was built on a geological fracture line and suffered enormous damage by earthquakes several times. In the 8th century BC 120,000 people lived in the walled city of Nineveh.The population of Nineveh amounted to about 300,000 people after the reign of Sanherib (704-681 BC). It was the largest city in the world for more than fifty years (668-612 BC). The destruction of Mosul is not only the destruction of history, but is part of the widespread destruction of cities with Sunni Arab-majority populations. Under the umbrella of the war against ISIS, the majority of Sunni cities have been destroyed. Thousands of Sunni civilians have been killed. Before the Mosul “liberation”, Tikrit and other cities and villages had already been destroyed, burnt and looted. A UN team described the destruction of Ramadi as “staggering”, with 80% of the city destroyed. Then came Fallujah. Then Al Qaim…. and the US-led coalition airstrikes are still transforming Sunni areas into rubble. Many Iraqis believe destruction was the plan all along to definitively silence the Iraqi resistance and rebellious Sunni-majority provinces. Remarkable is MercyCorps’s two-year investigation “Investing in Iraq’s Peace”, published in January 2016. The main finding is that sectarianism is not the main cause of the current unrest. When the Islamic State of Iraq and Syria (ISIS) quickly conquered a large part of the Sunni part of Iraq in 2014, experts described this as a natural consequence of the sectarian heritage of the country and a consequence of the Sykes-Picot accords, with the artificially drawn border between Iraq and Syria. But from MercyCorps research between 2013 and 2015, it appears that the main factor for the rise of ISIS is not the sectarian division, but rather an absence of inclusive, responsive and responsible governance. After the invasion of Iraq, political actors including the USA, actively planted the seeds of sectarian divisions for political gain. Sunni and other minority groups were systematically marginalized, harassed by security forces, accused of terrorism and locked up without evidence or trial. Public services hardly worked. This policy based on division fuelled sectarian ideas and created sympathy for groups like ISIS, claiming to be an alternative to the corrupt Iraqi government. The news about the resignation of Prime Minister Maliki in August 2014 was considered by the Sunnis as good news, and Sunni support for armed groups such as ISIS dropped from 49% to 26%. Although Prime Minister Maliki’s successor Haider Al-Abadi is also a shiite, Sunnis expected an improvement in public services and their perceptions about government agencies changed. In other words, sectarianism does not appear to be the primary or only cause of instability. Proper administration would greatly reduce support for further sectarian polarization. But the expectations of better governance have not been met. Little progress has been made in the promised reforms. As a result, public opinion polls show that trust in the central government continues to erode. From July 2015, public frustration caused major violent demonstrations across the country against corruption, poor services and sectarianism. These protests are still continuing.Nevertheless, the non-violent movement threatens to be overshadowed by the growing success of armed groups, including the increasingly powerful Shiite militias. 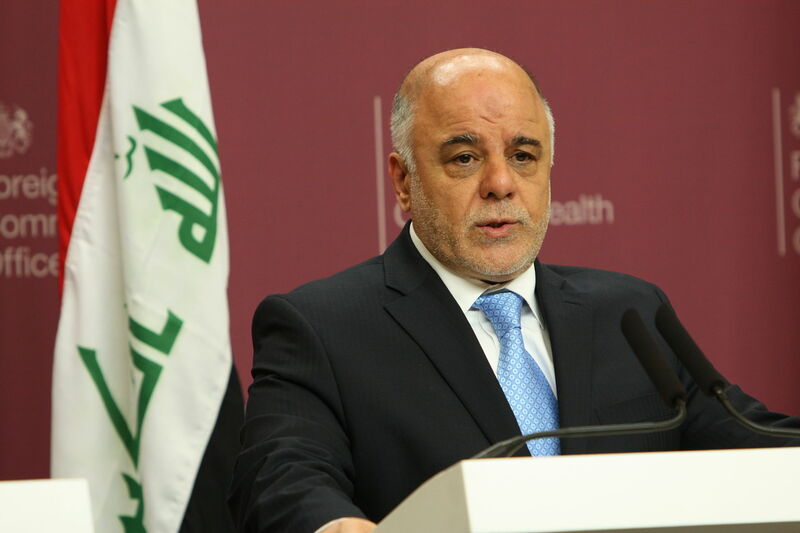 Premier Abadi seems to have little control over these militias and this poses a major threat to the future of Iraq. The study shows that improving government performance is essential for a just and peaceful Iraq. Unfortunately, donor investment in Iraqi civil society is deteriorating. In 2011, the US government’s annual spending on one soldier in Iraq was an average of $ 802,000 – or 80 billion dollars a year for a minimum attendance of 10,000 troops. What the US government plans to invest in democracy and civilian programs in 2016 is nothing, compared to military spending: $ 72.5 million. There is no miraculous solution for building stability in Iraq, but good governance is essential for addressing the causes of instability and active civil society is essential for good governance. The toll of the conflict for individuals and families is unusually hard. For close relatives who were locked in the west side of the city, life has been a living hell since the beginning of the conflict. Not only were they haunted by ISIS, there have been also many crimes and abuses by Iraqi troops since the operation began in 2014. The government in Baghdad has never held anyone accountable. Premier Al Abadi has often criticized human rights organizations investigating the crimes. The fact is that torture and abuse are institutionalized within the Iraqi armed forces, and in all cases they are tolerated by the judiciary. ISIS brought an extreme brutality to Iraq that shocked the country and the world. Now the armed forces are guilty of the same kind of extreme violence. A testimony in an article from the online news site Middleeasteye reveals the horror of the war. What remains of this part of the ancient city of Mosul, where the Islamic state (IS) fighters made their last stand, is a terrible place. And what is under the rubble is testimony of the dark final days of the struggle for Mosul. Hundreds of bodies lay half buried under the rubble and litter, which was once a flourishing historic district. The dissolution of the bodies occurs rapidly in the scorching 50 ° C summer heat. Feet are the most striking remains. The last murder party has left terrible traces, and it seems that someone wants to quickly remove these traces. In the past week, armored bulldozers have driven back and forth over the demolished houses and hundreds of bodies buried under the rubble. But the dead do not go away. Rotting body parts color reddish in the midst of the light gray dust and debris of destroyed buildings. After security is guaranteed, the next major step for Mosul will be reconstruction. Lise Grande of the United Nations claims that the situation in East Mosul is going well. There are schools and businesses open, many residents have returned. Local contractors work hard to restore services, and they use local employees. West Mosul is a very different story. There are 38 out of 54 residential areas severely damaged. That means that much more has to be done than in the east. The first United Nations forecast was that it would cost $ 470 million to restore electricity, water, sewerage, hospitals, schools and homes in the most affected areas. For the remaining parts of the western half another $ 237 million would be needed. That’s twice the amount originally estimated by the United States, and those figures are likely to continue to rise.The United Nations has a plan to form civilian groups, composed of local leaders, officials, tribes, etc., who will decide which homes and buildings will be rebuilt and which ones. The UN hopes that this will also promote further reconciliation through dialogue in neighborhoods. The provincial government will begin restoring services in the next few weeks in the west. The World Bank is also involved in the process and launching projects to rebuild bridges across the Tigris River. Through the World Bank and foreign donors, Iraq wants to get the largest amount of money to rebuild Mosul. Up to now, approximately $ 300 million has been collected, and two donor conferences will be organized to ask for more. It is unclear whether this will be able to make the city live again. An Iraqi senior official estimates that the cost of reconstruction of Mosul will be more than $ 50 billion. The regime in Baghdad was mandated in May last year to negotiate a $ 5.4 billion loan with the International Monetary Fund, demanding sharp cuts in social services. The country’s economy declined by 10.3 percent in 2016 due to falling oil prices and the effects of the war. The Iraqi government has achieved a major victory by destroying ISIS as a state-structure with an extensive area. But the terrorist movement has shown that it is able to adapt to new realities. How many weapons and heavy equipment of three Iraqi army divisions ISIS captured when Mosul conquered in June 2014 was never communicated. Much of this weaponry was hidden by ISIS in tunnels, gorges and valleys in areas of western Iraq and eastern Syria. If ISIS loses these areas, it will simply recover as an armed organization returning to unconventional warfare. The real power of ISIS follows mainly from the political circumstances of Iraq after the occupation. The sharp contradictions in Iraq contribute to instability and can create the same conditions that led to the rise of the ISIS. Sunnis were excluded from the political process of the country. So the future of ISIS in Iraq depends on the success of the political process in an ethnically and religiously divided country. It is unlikely that the Iraqi government will fulfill its promises to the devastated Sunni provinces, and the confidence crisis between the Sunnis and Shiites will only worsen. Without a political process that can integrate the Sunnis and realize their fair demands, ISIS will come back in many forms and it can even become more violent. Western countries should come up with diplomatic solutions, instead of putting oil on the fire, by always choosing the military option. Unless they do that, no strategy to defeat ISIS or any other extremist group will be effective. Bombs may even prove to be counterproductive: civilian casualties and damage to infrastructure can push communities further into the arms of extremists. Not only ISIS, but also the Iraqi government’s security forces are part of the problem. So it’s a bad idea to side with one butcher to defeat another one. What has been done up to now to achieve a political solution? Nothing. There is a lot of meaningless talk about diplomatic initiatives, but that has already been the case since 2007. Nothing has happened on the diplomatic front. Only massive arms deliveries, the presence of US advisers in all ministries and an embassy larger than Vatican City with more than 10,000 US intelligence officers and mercenaries or contractors, that has been so far the result of “diplomacy”. On June 19, 2014, American President Barack Obama declared that there is no military solution, and that a political solution is the only way to solve the problems in Iraq. The White House, however, continues to provide the Iraqi government with US troops and weapons. An estimated 20 percent of the Iraqi national budget of 2016 was spent on defence, including the salaries and arms of the Hashd al-Shaabi militrias. The gross domestic product in Iraq amounted to $ 168,61 billion in 2015. Thus the Iraqi government’s military expenses reached $ 33,72 billion, while Iraq faces a humanitarian disaster. Iraq’s national and foreign debts will most likely to exceed $125 billion before the end of 2017, according to predictions of the IMF. If the deficit keeps on growing, Iraq would be at risk of bankruptcy in 2017, the inability to pay its employees’ salaries and social security services. This situation would seriously hamper the necessary reconstruction of the country. Military force can be part of fighting extremism, but it is a dangerous method, particularly when the main goal – as it must be – is winning over communities. Only forces that can establish positive local relations should have participated in the assault against ISIS. It was probably better to rule out Shia militias in Sunni-majority areas and Kurdish forces in Arab lands. The Sunni community was able to drive out al Qaeda during the US occupation, but was not so willing to drive out ISIS after 2014, because of the severe repression of the Iraqi government against the Sunni community since the withdrawal of the American troops. Conquering the territory and losing the people – as happened in the aftermath of the US invasion of Iraq -can make everything worse. The responsibility for the next phase is on the shoulders of the Iraqi government. It must try to control Iraqi armed forces and Shiite militias, punish human rights violations and war crimes, such as happened during the liberation of Tikrit, Fallujah and Diyala. It must ensure that the Arab Sunni population is no longer marginalized and their voices and concerns are heard. The government must act quickly to house the millions of homeless people and restore the services. It doesn’t look like the Iraqi government will change its attitude. All political groups, both among Shiite, Sunni and Kurds, are hopelessly divided. Without a comprehensive political settlement agreed by all parties, any post-ISIS situation will end in new conflicts, which will have catastrophic consequences for the unity of the Iraqi state and the country will continue to sink further into chaos. The Iraqi government is faced with the huge challenge of convincing all factions to put their own political ambitions aside.The first signs are not very hopeful, with conflicting statements about governance structures by Kurdish, Shia and Sunni leaders. A sustainable political agreement must be reached about a reconstruction and reconciliation plan for stability in the region, provided that it is considered fair. Any sustainable solution about the country’s future must address fundamental issues in order to achieve greater social and economic integration of the different ethnic and religious groups of Iraq. Iraq has a strong civil society, trade unions and opposition groups, which do have elaborate plans and offer solutions to get rid of the disastrous situation in the country. The government and the Western coalition don’t want to listen to their pleas. This makes it particularly difficult to restore stability. The reason for not consulting the civil society is obvious: the Iraqi people want an end to foreign interference and they want their pre-invasion semi-socialized country back and the control over their own resources. The neoliberal Western imperial establishments won’t allow that and so they keep on fuelling the flames of sectarianism. The end of Iraqi sovereignty? After the US withdrawal in 2011, Iraq remained dependent on US military and logistical support and protection.Collaboration with occupation forces has benefitted at least two-thirds of Iraq’s post-2003 political class, while the Iraqi people suffered greatly. Meanwhile, Iran has strengthened its grip on the Iraqi state. On 26 November 2016, the Iraqi parliament legalized the Hashd al-Shaabi, known as the Popular Mobilization Forces (PMF), predominantly Shiite paramilitary troops, now getting legal status besides and apart from the regular Iraqi army. Why have Iraqi legislators decided to legalize the PMF? What does this mean for the future of the state and society in Iraq? The PMF originated in response to a fatwa, a religious edict, announced June 13, 2014 by Great Ayatollah Ali Sistani, an Iraq-based Iranian spiritual and highest religious authority of the Shiite community. In response to the threat of ISIS, Sistani then called for a jihad against this terrorist group and in his fatwa he urged the Iraqis to take up the weapons against ISIS. This was conceived as a green light for dozens of Iran-supported Shiite militias to unite in a huge super-militia, the Hashd al Shaabi. Men like Hadi al-Amiri, Qais al-Khazali and Abu Mahdi al-Muhandis, heads of the three largest and most powerful Iran-supported militias, are now the main commanders of the PMF. Why does the PMF enjoy so much impunity and lack of accountability? The answer lies in the influence and control of Iran on a large part of the Iraqi state structure, not least the Hashd al Shaabi, now being prepared to become a full Iraqi version of the Iranian Pasdaran, better known as The Islamic Revolutionary Guards (IRG), a parallel and potentially competitive force besides the Iraqi army. The new law states that the PMF is under the direct authority of the prime minister itself, which means that the Iraqi Defense Minister has no authority or control over them.Leaders like al-Amiri, al-Khaz’ali and al-Muhandis are all directly linked to Iran. They are not only loyal to Iraq, but also to the supreme leader of Iran, Ayatollah Ali Khamenei. Three major militias, the Badr Organization, Asaib Ahl al-Haq and Kataib Hezbollah use images of Khamenei on their posters and websites. Instead of calling the ISIS fighters and their supporters “sad murderous losers”,we must first of all try to understand the complex social, economic and political factors that made ISIS a success story. In addition, Iraqi civilian peace initiatives should actively be supported and published by the media. With a fraction of the astronomical sums spent on the war, valuable projects that transcend the sectarian fault lines, should be promoted. The problem is also this: We must urgently come to terms with our own devastating role in the Middle East and North Africa crisis (MENA). Military interventions from the West in the MENA region have played a decisive role in the radicalization of Muslims in the West. The West has supported the Iraqi government when they were shooting unarmed Sunni demonstrators, bombing Sunni territories and supported Shiite militias that committed large-scale war crimes. Putting all the emphasis on ISIS also has an important political role: the denial of the Western destructive war campaign, which has destroyed the region, hurt the population and caused a major refugee crisis. Military engagement can potentially weaken the influence of ISIS by demonstrating that they are not invincible. But their eventual eradication will be the result of political processes that may take decades. In the meantime, preventing the destructive fragmentation of multicultural Western societies should be the priority. This requires a clear rejection of the politics of fear, and using the means for prevention at home instead of bombing the Middle East. Dirk Adriaensens is a member of the executive committee of the BRussells Tribunal. Between 1992 and 2003 he led several delegations to Iraq to observe the devastating effects of the UN sanctions. He was a member of the International Organising Committee of the World Tribunal on Iraq (2003-2005). He is also co-coordinator of the Global Campaign Against the Assassination of Iraqi Academics. He is co-author of ‘Rendez-Vous in Baghdad’, EPO (1994), ‘Cultural Cleansing in Iraq’, Pluto Press, London (2010), ‘Beyond Educide’, Academia Press, Ghent (2012), Global Research’s Online Interactive I-Book ‘The Iraq War Reader’, Global Research (2012), ‘Het Midden Oosten, The Times They are a-changin‘, EPO (2013) and is a frequent contributor to Global Research, Truthout, Al Araby, The International Journal of Contemporary Iraqi Studies and other media.